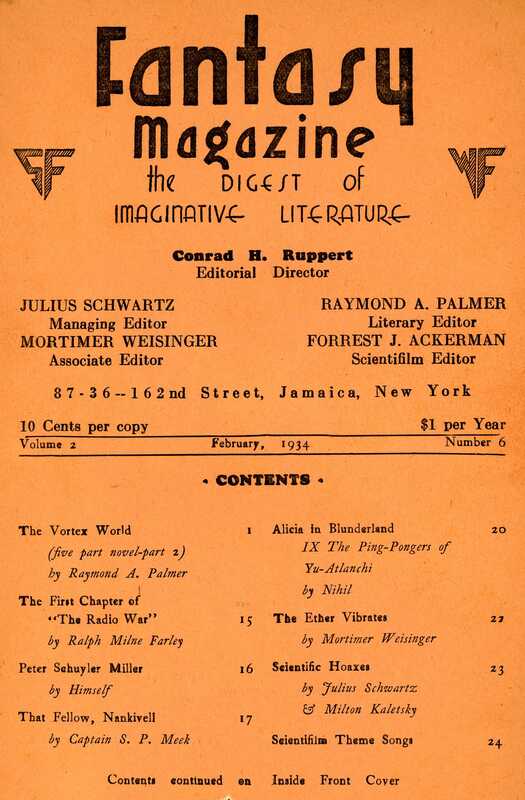 The emphasis on publishing fiction was evident in the February issue, where more than half of the 32 non-Cosmos pages were taken by stories from Ray Palmer and Ralph Milne Farley. Alicia in Blunderland was a serial satire of science fiction written under a pseudonym by the very same Peter Schuyler Miller. It appeared in issues of SFD/FM beginning in June, 1933. A collection of the chapters was published by Oswald Train in 1983. “I just received the December issue today. In your The Editor Broadcasts, I notice a bit of repartee in which I feel inclined to take a hand. It is a criticism by Milton Kaletsky of Ralph Milne Farley. I am sorry to say I did not read the chapter to which Mr. Kaletsky refers, but I know from my own reading that he is right about the star Alpha Centauri. I quote from Harlow Shapley’s ‘Flights from Chaos:’ ‘Alpha Centauri is a triple system, the third a pronounced dwarf, called “Proxima”.’ Perhaps Mr. Farley should not depend upon his Brittancia in matters which are changing rapidly. “As regards velocities exceeding that of light, I’m afraid neither of our eminent friends has secured any empirical data proving either side to be right. Theories hold good only so long as they are not at variance with observed facts. Then it is time to build a new theory, and waste no time bewailing the old one. “It is my conviction that fiction writers should at least remain within known facts – especially when they are established by mathematics. Witness: In his Pellucidar stories, Burroughs calmly ignores the well-known mathematical proff that there could be no attraction (no resultant attractions, perhaps I should say) within a hollow sphere. At any point the resultant attraction is zero, and as a consequence, there would be no gravitation. Apparently this bothers few readers, for I have yet to read a verbal protest – no doubt they realize the impossibility of the whole fantasy, and its improbability as well! “Whether or not our authors should allow their styles to be cramped by current theories is open to argument. However, as an example, look what whopping good yarn Edwin Balmer and Philip Wylie made of “When Worlds Collide” by sticking strictly to known facts and established theories. Ouch! Well met, Mr. Winks, and a nice articulation of the tension regarding “fact” that the science fiction and fantasy communities were wrestling with at the time. “The Science Fiction Eye continues to see all, know all, and tell all. Julius Schwartz has become a sort of Walter Winchell of science fiction. “Your short stories and serials from been uniformly poor. ‘Scroll of Armageddon’ is without doubt the rottenest yarn ever turned out by that amazing fiction factory, A.J. Burks. COSMOS continues as it began: unadulterated bilge. I still think you should leave the fiction out, your readers can get plenty of it elsewhere, now that Astounding Stories, Unusual Stories, The Fantasy Fan, etc. have widened the market. Maybe I’m wrong. I have been wrong very, very often. But judging from the letters I received (what else can I judge reader’s reactions by?) “Scroll of Armageddon” and COSMOS, and our other fiction, were well liked, and enjoyed, by the vast majority of our readers. But, maybe I’m wrong. “FANTASY Magazine, you’ve got everything!